by Baron Halpenny, LincsMag Editor-in-Chief. 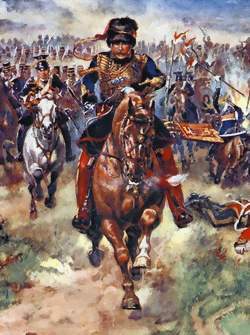 The charge of the Light Brigade took place at the battle of Balaclava on 25th October 1854, in the Crimean War with Russia. It was the result of a mistaken order, and in twenty-five minutes more than two-thirds of these British soldiers had been killed or wounded. The great Lincolnshire poet, Lord Alfred Tennyson in this famous poem has, given deathless fame to the brave soldiers who went forward, fearless in obedience to command although they quite well realized they were going to almost certain death. This poem was first published on the 9th December 1854, the same year as the battle. It’s interesting to note that Tennyson’s “Charge of the Heavy Brigade at Balaclava” was never popular, and is unknown except to literary scholars. 0 the wild charge they made!